First Presbyterian Church is offering an opportunity for school aged children (K-12) to get together once a week with friends for lunch during June and July! Your friends at First Presbyterian Church (201 W. 4th Street) are providing a free lunch and a movie for Delavan schoolchildren. Parents and guardians are welcome too! Children younger than five are welcome to come also, when accompanied by a parent or guardian. June 13th – Pizza, Fresh Vegetables with Dip, Fruit Cup, Cookie, and a Take Home Snack. June 20th – Tacos, Nachos, with Meat, Lettuce, Tomatoes, and Cheese; Fruit, Cookie, and a Take Home Snack. 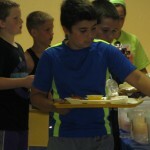 June 27th – Sloppy Joes, Tater Tots, Vegetables with Dip, Fruit, Cookie, and a Take Home Snack. July 4th – Spaghetti and Meat Sauce, Fresh Salad, Garlic Bread, Fresh Melon, Cookie, and a Take Home Snack. July 11th – Chicken Nuggets, Mac and Cheese, Vegetables with Dip, Fruit, Cookie, and a Take Home Snack. July 18th – Tacos, Nachos, Meat, Lettuce, Tomatoes and Cheese; Fruit, Cookie, and a Take Home Snack. July 25th – (Last Summer Meal) Children’s choice of any of the above meals (will be voted on July 18th) and a Take Home Snack.